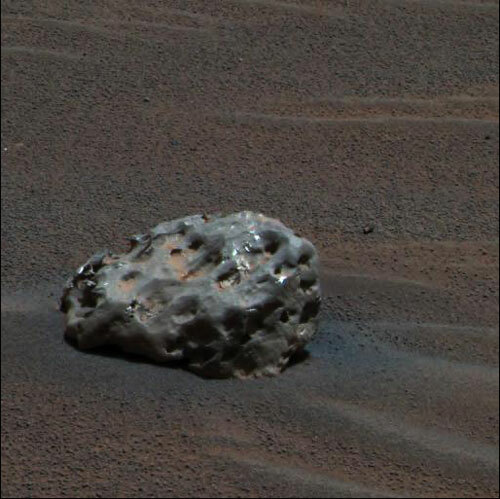 NASA's Mars Exploration Rover Opportunity has found an iron meteorite on Mars, the first meteorite of any type ever identified on another planet. NASA's Mars Exploration Rover Opportunity has found an iron meteorite, the first meteorite of any type ever identified on another planet. The pitted, basketball-size object is mostly made of iron and nickel according to readings from spectrometers on the rover. Only a small fraction of the meteorites fallen on Earth are similarly metal-rich. Others are rockier. As an example, the meteorite that blasted the famous Meteor Crater in Arizona is similar in composition. "This is a huge surprise, though maybe it shouldn't have been," said Dr. Steve Squyres of Cornell University, Ithaca, N.Y., principal investigator for the science instruments on Opportunity and its twin, Spirit. The meteorite, dubbed "Heat Shield Rock," sits near debris of Opportunity's heat shield on the surface of Meridiani Planum, a cratered flatland that has been Opportunity's home since the robot landed on Mars nearly one year ago. "I never thought we would get to use our instruments on a rock from someplace other than Mars," Squyres said. "Think about where an iron meteorite comes from: a destroyed planet or planetesimal that was big enough to differentiate into a metallic core and a rocky mantle." Rover-team scientists are wondering whether some rocks that Opportunity has seen atop the ground surface are rocky meteorites. "Mars should be hit by a lot more rocky meteorites than iron meteorites," Squyres said. "We've been seeing lots of cobbles out on the plains, and this raises the possibility that some of them may in fact be meteorites. We may be investigating some of those in coming weeks. The key is not what we'll learn about meteorites -- we have lots of meteorites on Earth -- but what the meteorites can tell us about Meridiani Planum." The numbers of exposed meteorites could be an indication of whether the plain is gradually eroding away or being built up. NASA Chief Scientist Dr. Jim Garvin said, "Exploring meteorites is a vital part of NASA's scientific agenda, and discovering whether there are storehouses of them on Mars opens new research possibilities, including further incentives for robotic and then human-based sample-return missions. Mars continues to provide unexpected science 'gold,' and our rovers have proven the value of mobile exploration with this latest finding." Initial observation of Heat Shield Rock from a distance with Opportunity's miniature thermal emission spectrometer suggested a metallic composition and raised speculation last week that it was a meteorite. The rover drove close enough to use its Mössbauer and alpha particle X-ray spectrometers, confirming the meteorite identification over the weekend. Opportunity and Spirit successfully completed their primary three-month missions on Mars in April 2004. NASA has extended their missions twice because the rovers have remained in good condition to continue exploring Mars longer than anticipated. They have found geological evidence of past wet environmental conditions that might have been hospitable to life. Opportunity has driven a total of 2.10 kilometers (1.30 miles). Minor mottling from dust has appeared in images from the rover's rear hazard-identification camera since Opportunity entered the area of its heat-shield debris, said Jim Erickson of NASA's Jet Propulsion Laboratory, Pasadena, Calif., rover project manager. The rover team plans to begin driving Opportunity south toward a circular feature called "Vostok" within about a week. Spirit has driven a total of 4.05 kilometers (2.52 miles). It has been making slow progress uphill toward a ridge on "Husband Hill" inside Gusev Crater. JPL, a division of the California Institute of Technology in Pasadena, has managed NASA's Mars Exploration Rover project since it began in 2000. Images and additional information about the rovers and their discoveries are available on the Internet at http://www.nasa.gov/vision/universe/solarsystem/mer_main.html and at http://marsrovers.jpl.nasa.gov .